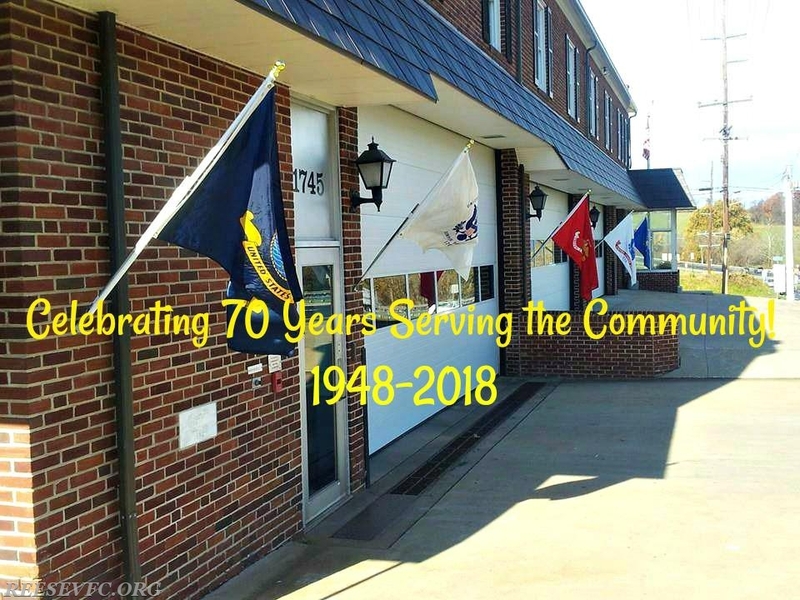 Earlier this month, on April 7, the Reese and Community Volunteer Fire Company held a banquet and awards ceremony to celebrate its 70th anniversary. The evening was well attended as members of the department, elected officials and community leaders filled the social hall above the engine bays at the station at the intersection of Md. 140 and Reese Road. Those in attendance included Carroll County Sheriff Jim DeWees, Commissioners Dennis Frazier, and Richard Weaver. Delegates Susan Krebs and Haven Shoemaker, Carroll County Circuit Court Judge Richard Titus, and “District Six Commissioner” Dave Bollinger. In recent years the company has sadly filled the social hall for the funerals of three of the community’s patriarchs, so ... many folks were happy to get together and celebrate the work of the fire company. Joseph Edward Spangler Sr. died Dec. 25, 2014. Spangler was a life member of the department with more than 50 years of service. He joined the department in 1961. He was the chief of the fire company from 1984 to 1985 and served as president for 14 years. Jake Caple, the last remaining founding member of the organization, died on May 8, 2017 at 88. At age 16, Caple and several friends help start the company when they bought a fire engine and housed it in his mom’s garage in 1948. Tommy Brothers, a 37-year veteran of Reese died unexpectedly of a heart attack at his home on March 15, 2018. His death at the young age of 55 came as a shock. Seventy years ago, Carroll County community leaders made good use of the winter months to get together and plan for fire protection. Two Carroll County volunteer fire companies got their start in 1948. In addition to the Reese organization, the New Windsor fire company held an organizational meeting Jan. 23, 1948. Two years earlier, the first Pleasant Valley Community Fire Co. fire hall — the "Patriotic Order of Sons of America" Lodge Hall, was purchased in January 1946 for $2,800, according to an interview with Pleasant Valley volunteer firefighter, now Carroll County Commissioner Steve Wantz, R-District 1. Reese started in a garage owned by Caple's uncle in 1947. A history published on the fire department's website reports that, “On the evening of Jan. 26, 1948, several people of Reese and the surrounding communities held a meeting at the garage ...” According to the site, Lexly Caple, Sterling Shipley, Harry Woodward, Cleveland Knight, Russell Knouse, Chester Taylor, Joseph Taylor, Irving Blum, and Holloday Blizzard were in attendance. Reese ordered its first piece of equipment on May 7, 1948. It was “an International KB-8 chassis with a KB-10 engine from the Gore Motor Company of Westminster Maryland ...” It cost $20,000. Fire company winter banquets and awards ceremonies are a storied tradition in Carroll County. According to an article in the Carroll County Times on March 28, 1957, 12 firefighters were handed diplomas for completing the “Basic Fire Training course, which is given by the Fire Service Extension of the University of Maryland… Graduation was conducted Wednesday night, March 20 at the Reese Fire Hall with a banquet prepared by the ladies auxiliary of Reese.